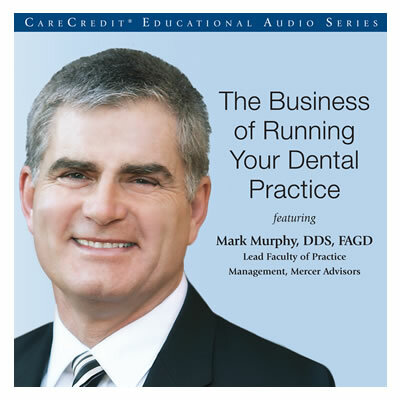 CareCredit is offering a free educational audio CD, The Business of Running Your Dental Practice, featuring Mark Murphy, DDS, FAGD, Lead Faculty of Practice Management, Mercer Advisors. In this audio program, Dr. Murphy shares information and his perspective on how dentists can become as skilled at the business side of the practice as they are in clinical aspects, so they can worry less. Dr. Murphy focuses on patient retention, case acceptance and referrals'all from a business perspective. Dentists and teams will learn how to evaluate the life-value of patients, provide a better patient experience, create a successful case presentation system to reduce treatment delays, open the door to new patients, and minimize patient attrition.